After a disappointing meal at Rockford (yes this was in the summer), all of us needed something sweet to balance things out. We briefly considered Death by Chocolate down the street; but that was quickly quashed. Face it, the place is expensive and the desserts are not that impressive. So where to? I quickly remembered a place I had driven by after my visit to Verace Pizzeria down near Rogers Arena. With all the recent condo developments in the area, many new businesses have opened up along Abbott Street. 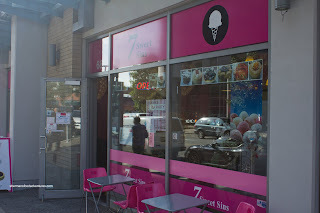 One of them happens to be a dessert joint named 7 Sweet Sins. From the outside, it really doesn't look like a classic dessert place. And one look on the inside, it has got this quasi-blended look that resembles one-half Asian bakery and one-half ice cream shop. Honestly, the desserts did not look very impressive in the display. In fact, I was ready to turn around head out. In the end, we stayed since it could accommodate our large group (including 6 kids). Furthermore, for a dessert place, the prices were incredibly cheap. Barely anything was over $5.00. 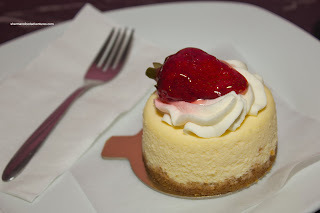 For myself, I played it safe and got the classic New York Cheescake with whipped cream and a fresh glazed strawberry on top. Well, for the price, I thought the cheesecake was alright. It was somewhat smooth and exhibited a good baked cream cheese flavour. It wasn't too sweet either. For my son, he went for the Chocolate Lava Cake which was more like a mini-bundt cake with melted chocolate and gold flakes (courtesy of the microwave...). Since the cake was "reheated", it was soft and moist. 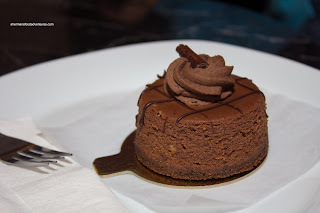 The chocolate ganache was not bad really, considering the venue. Let's be honest here, we really needed to have reasonable expectations here... On that note, I did find the dessert to be quite sweet though. Marshmallow's son had the Chocolate Walnut Cake which he devoured within 3 bites. 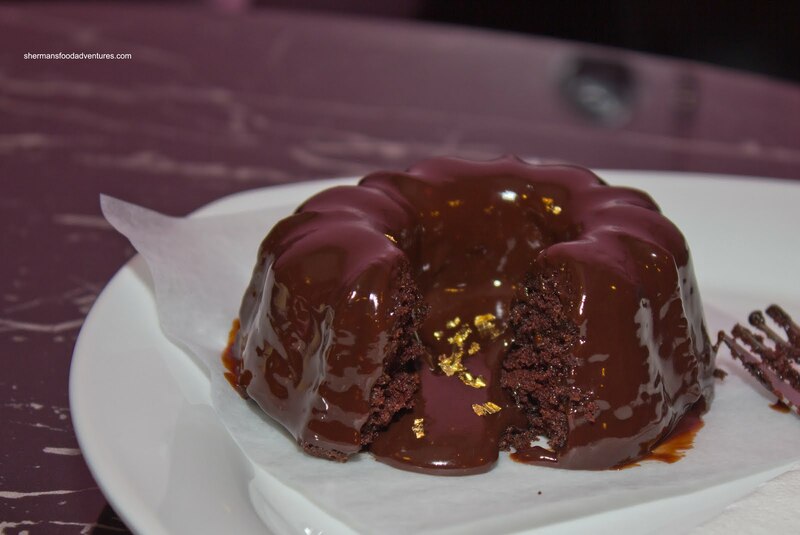 Of course asking a kid what he thought of chocolate cake would akin to asking if a foodie liked eating. Hence, I can only ascertain that it was alright. Right next to me, Rich Taiwanese Guy (yes, this is a different rich fellow), had the Chocolate Caramel. 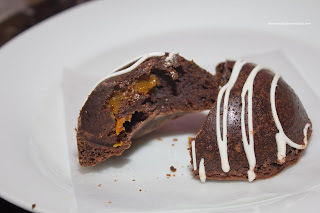 This hard shelled chocolate cake/brownie- like thing had a soft caramel centre. He remarked it was quite sweet, which was not at all surprising. In the end, he thought it was dense while still alright. His indifference sort of said it all. And really, what would one expect with desserts that are around $5.00? Also, the microwaving of the lava cake illustrates what 7 Sweet Sins represents. 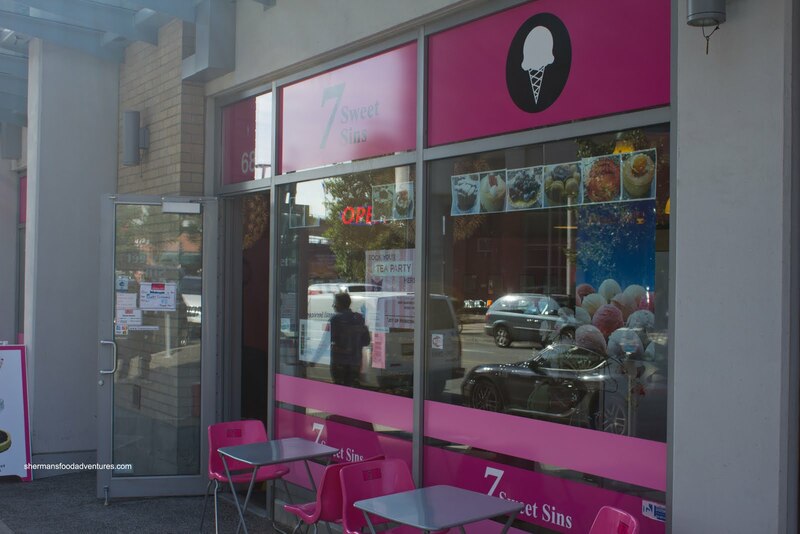 So if one is not too picky and wants a place to hang out while munching on so-so desserts, then 7 Sweet Sins is your place.